New York: Harper & Brothers Publishers, 1912. First editions of the first novel of the author’s acclaimed Trilogy of Desire. Octavo, original cloth. Near fine in a very good dust jacket with some unnecessary tape reinforcement to the verso with some bleedthrough. Rare in the original dust jacket. Frank Cowperwood, a fiercely ambitious businessman, emerges as the very embodiment of greed as he relentlessly seeks satisfaction in wealth, women, and power. As Cowperwood deals and double-deals, betrays and is in turn betrayed, his rise and fall come to represent the American success story stripped down to brutal realities-a struggle for spoils without conscience or pity. Dreiser's 1912 classic remains an unsparing social critique as well as a devastating character study of one of the most unforgettable American businessmen in twentieth-century literature. New York: Modern Age Books, 1941. Second printing. Octavo, original cloth. Presentation copy, inscribed by the author on the front free endpaper in the year of publication, “To the one who, in a sincere wish for American and world peace, buys this book. The compliments and best wishes of Theodore Dreiser Hollywood. April 1941.” In near fine condition. First editions of the first novel of the author’s acclaimed Trilogy of Desire. Octavo, original cloth. Signed by the author on the front free endpaper, “Theodore Dreiser N.Y. Jan. 1938.” Bookplate removal to the pastedown, in near fine condition. Rare and desirable signed. New York: Boni & Liveright, 1925. First editions of both volumes of Dreiser’s epic tragedy. 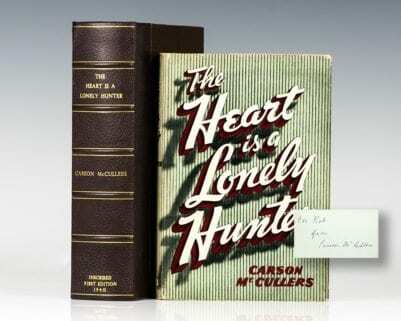 From the library of American novelist Wallace Stegner, with his signature to the front free endpaper of both volumes. Often referred to as “The Dean of Western Writers”, Wallace Stegner taught at both Harvard and Stanford University where he founded the creative writing program; his students included Sandra Day O’Connor, Robert Stone, Ken Kesey, and Larry McMurtry. Stegner’s novel Angle of Repose won him the 1972 Pulitzer Prize for Fiction; and in 1977 he was awarded the National Book Award for The Spectator Bird. Octavo, 2 volumes, original cloth, gilt titles to the spine. In very good condition. An exceptional association linking two highly influential 20th century American novelists. 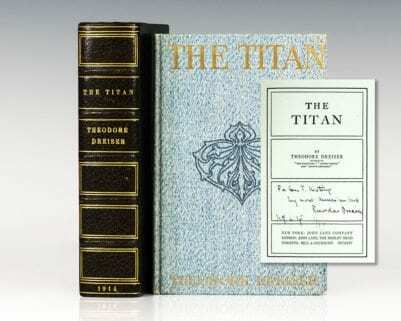 The Trilogy of Desire: The Financier, The Titan, and The Stoic. New York: Harper & Brothers Publishers, 1912-1947. First editions of each novel in the author’s acclaimed Trilogy of Desire, from the library of American novelist Wallace Stegner, with his signature to the front free endpaper of The Financier. Often referred to as “The Dean of Western Writers”, Wallace Stegner taught at both Harvard and Stanford University where he founded the creative writing program; his students included Sandra Day O’Connor, Robert Stone, Ken Kesey, and Larry McMurtry. Stegner’s novel Angle of Repose won him the 1972 Pulitzer Prize for Fiction; and in 1977 he was awarded the National Book Award for The Spectator Bird. Octavo, 3 volumes. In near fine condition. An exceptional association linking two highly influential 20th century American novelists. Chains: Lesser Novels and Stories. Signed limited edition of Dreiser’s second short story collection, with two stories published herein for the first time. Octavo, original black cloth. 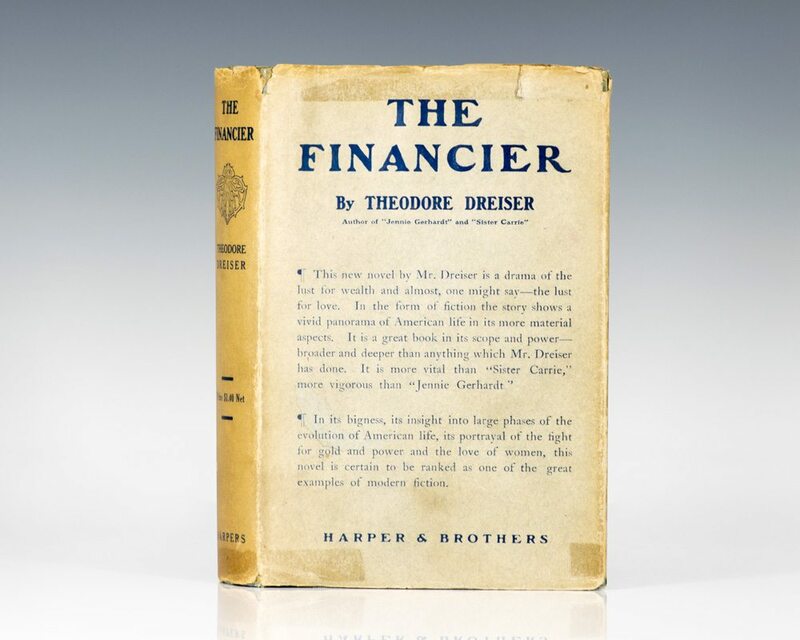 Limited to 440 copies, 425 of which were for sale, signed by Theodore Dreiser. In very good condition. New York: John Lane Company, 1914. First edition of the second book in the author’s acclaimed Trilogy of Desire. Octavo, original cloth. Presentation copy, inscribed by the author on the title page, “For George T. Keating my most American book Theodore Dreiser N.Y. City 1919.” The recipient George Keating was a well-known book collector in the early twentieth century, who amassed a large Joseph Conrad collection. In near fine condition with a touch of rubbing and offsetting to the endpapers. Housed in a custom half morocco clamshell case.